I have spent some hours playing Fallout 76 now and I do not think it feels like the other Fallout games. Maybe because of the lack of NPCs? If I played with other people maybe it would feel different? One of the signatures of the Fallout series is the personalities of the NPC’s and the touch of humor they bring to the post-apocalyptic world. With nothing to keep you company other than monsters, vender robots with no personality and your own thoughts, Fallout 76 is a different kind of game. I did not realize how much the personalities of the NPCs added to the previous Fallout games until they were not there. Now it just feels like a lonely and hollow place with nothing to lighten the mood. It just feels out of balance. At least when you are playing solo. I don’t want to say Fallout 76 is a bad game. But it is not the fallout games you have come to love. It also has not hooked me. Sure I have played for many hours but I get tired of it at times and turn it off. Or when I have free time I would rather play something else. That never happened with the old games. Some of my friends are planning on picking up the game when the price drops and I am hoping it will be a different experience when playing with others. But at this point, I would say it gets old fast as a solo game and I do not have any plans to continue playing it if I am solo. Enemies falling or clipping into the ground. At one point I got swarmed by 5-6 ghouls so I started shooting while falling back in order to not get surrounded. That’s when a few of the ghouls fell into the ground and started attacking me from below. I could only see parts of them clip above the ground so it was very hard to fight back. When you kill something there is this long delay between the sound of the gun going off and their body falling to the ground. Voice chat is always on and your computer mic is always on. There is no way to set a push to talk button or to turn it off in the game. I ended up muting my mic in windows when I am not using it. The game seems to make everything blurry in the distance. Like something you would see in a photograph where the background is not in focus. I also hate the lighting. I guess they are trying to mimic the sun being in your eyes but it is just annoying. At least in real life I can put on sunglasses or hold my hand in front of the sun. In Fallout 76 I am just blind. it is so very annoying when I am trying to get an idea of what is at the top of a hill or down a road. It just makes my eyes hurt. When I try to close the game it just crashes instead of closing out nicely. 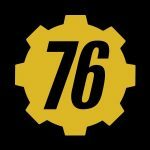 Support for the game leaks Fallout 76 Customer information. Including Names, Addresses & Phone Numbers. I am still not happy that the game is only online but I have to admit it does not run badly on my crappy internet. Because of this, I have a feeling a lot of the processing for the game is done client side. But if that is true that could open the door to hacking. Voice chat just seems to work well if you can get over the mic always being hot. The C.A.M.P. system is fun. I like that idea a lot and I have got more joy out of building my camp then I have from any other part of the game. And that is kind of sad. I like that you can change out your perks anytime you want to but the bad thing is you can not change your S.P.E.C.I.A.L points. I loaded up a tool to record bandwidth and it seems like fallout is downloading around 45 MBs an hour while I just wander around by myself. We can assume this would go up a little if you are playing with others and using voice chat. Patching is also a big part of bandwidth usage and Fallout 76’s first patch was 15.18 GBs in size. I hope they are not all this big. I hear the game has microtransactions but at this point I have not seen them. So that makes me happy that they are not trying to push them down our throat. 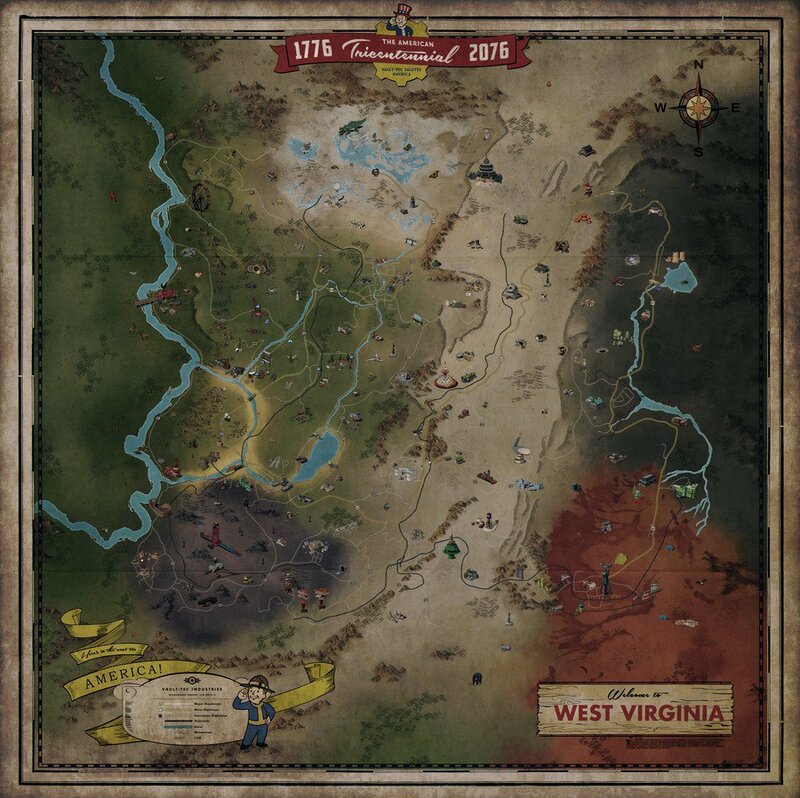 Here is a Fallout 76 map with what looks like lots of in-game locations. Click the map to see a bigger size. Some Random Fallout 76 facts. Todd Howard said Fallout 76 takes place before all the other fallout games and it is 4 times bigger than Fallout 4. The game takes place in West Virginia and will draw upon local lore and legends to bring the game to life. Building mode like Fallout 4 but you can build where ever you want to. Fallout 76 will cost $59.99. Fallout 76 will not be available on Steam. Change the way your character looks anytime you want to. It sounds like there is no level cap based on what Todd said at QuakeCon. You do stop getting points to equip perks at level 50. But you can still get new perks and switch them out. You can respawn anywhere you want that you have unlocked but you have to pay caps to spawn far away. There will be no cross-play between Xbox, PlayStation, and PC. Todd Howard claims the reason is that Sony will not allow it. I would not suggest Fallout 76 to anyone who wants to play solo. Save your money and get a single player game because this game gets boring fast when you are playing on your own. This is definitely not the Fallout games you have come to love and expect. But if you do not expect the normal fallout experience and enjoy walking around in a mostly lifeless world then you may find the game enjoyable. With that being said it may be a perfectly good game if you have a group of friends you play with. I can’t speak to this because none of my friends have purchased the game and I have not had much luck with finding random people in game that want to group up. Here are a few reviews that basically sums up how I feel about the game. This entry was posted in Games, Reviews on November 19, 2018 by Zack.